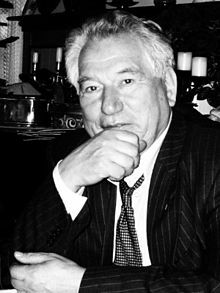 Chyngyz Aitmatov (Russian: Чинги́з Тореку́лович Айтма́тов) (12 December 1928 – 10 June 2008) was a Soviet-Kyrgyz author and diplomat. He wrote in both Russian and Kyrgyz. He is a famous author in Kyrgyzstan's literature. His best-known work abroad is a novel The Day Lasts More than a Hundred Years, which has folklore and science fiction elements. Aitmatov was born on 12 December 1928 in Sheker village, Kirghiz ASSR, USSR. Aitmatov was first the ambassador for the Soviet Union and later for Kyrgyzstan, to the European Union, NATO, UNESCO and the Benelux countries. In 1963, he was honored with the Lenin Prize for his works in literature. Aitmatov died on 10 June 2008 from kidney failure and pneumonia in Nuremberg, Germany, aged 79. This page was last changed on 16 November 2018, at 09:48.